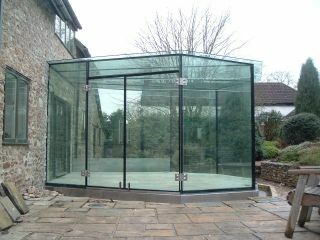 Frameless double glazed garden room made of structural glass. 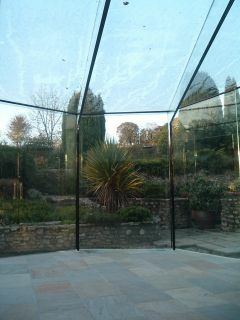 The garden room connects the existing kitchen and breakfast area with the surrounding gardens and stone paved terraces, in this previously converted barn. Although well lit during the day, floor and wall mounted electric fixture allows the use of artificial lighting at night. Additional heating is provided by an electrical mat fitted under new stone tiles. 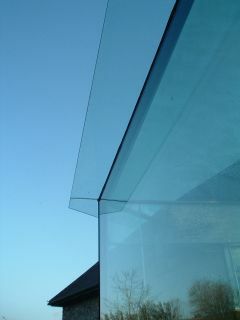 The floor level is placed at the same level as the rest of the house so that the space flows un-interrupted internally. The main house is located within the cartilage of an existing listed building grade II and therefore had conservation constraints attached.